The French cargo sales agent European Cargo Services has won Thai Airways as new client in India. The cooperation is expected to start in April, although limited to Mumbai. Thai is no newcomer to ECS since the Paris-based agent manages the airline’s cargo biz already in Italy, France and Austria. 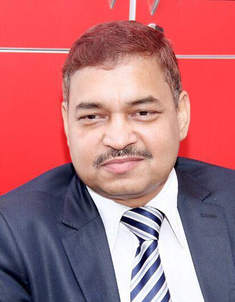 “Being responsible for our new partner’s air freight affairs in Mumbai is a very welcome start,” reacts Rajendra Dubey, country manager for India at the ECS Group. Having a foot in the door might help to expand the cooperation and take over sales at other destinations served by Thai in times ahead. “Provided, the service we offer our client in Mumbai is convincing,” he cautiously adds. Thai Airways serves Mumbai daily, operating a Boeing 747-400 passenger aircraft on that route. Although the B-400 can easily accommodate 18 to 20 tons per flight, ECS India estimates that the load per departure will not exceed 11 tons “due to the masses of luggage brought in by travelers which limit the plane’s cargo capacity.” So weekly this will amount to 70 tons contributed by ECS, he says. In Bangkok, Thai Airways connects to all major East Asian and Australian destinations, thus offering many routes for air transports to and from India. “We expect generating almost 4,000 tons annually for our new mandate airline,” states Rajendra. Thai Cargo awarded his firm the contract as result of a tender and tough evaluation process, following the qualification procedures. “As a matter of fact we successfully succeeded in all four rounds of the bid,” states manager Dubey proudly. Speaking of the commodities he expects running best, Rajendra mentions pharmaceuticals, fabrics produced in India and consolidation shipments made of all kinds of goods. “ECS India is proud to be associated with Thai Airways and will ensure to deliver the best results for a long run partnership,” he states. Two years ago, ECS had already landed a major coup in India by contracting low cost carrier Air Asia India. They service domestic Indian routes, deploying six Airbus 320 passenger aircraft, each capable of loading 3 tons per flight. Due to their 28 to 29 daily flights, it adds up to 1,100 tons per year contributed by Rajendra and his teammates. This could only be the beginning because CargoForwarder Global was told by insiders that Air Asia India plans to expand its network, eyeing destinations in Europe and Southeast Asia. If so, larger aircraft are needed, upping the capacity substantially for air freight carriage.